Rhino News, etc. : Rhino behind "The Wandering Earth"
Rhino behind "The Wandering Earth"
Rhino has become the tool of choice for many users, especially when it comes to a challenging project. In The Wandering Earth, the 2019 Chinese science fiction film, many special items and clothing were realized by using Rhino, including the super-simulated spacesuit. Studio MDI, one of the main creative teams, shared with us how they used Rhino to complete the design and structural design of the film props and to produce and present the physical objects in the film. Li Jian, the designer in charge of spacesuits in Studio MDI, explained that their team is a combination of animation and industrial design. For a project such as The Wandering Earth, the director and art group initially provide the settings and some related references. As the discussions with Studio MDI follow, the focus gradually narrows to a few manuscripts. With the director's approval, the industrial designers begin. Li Jian comments, "We use Rhino to carry out the follow-up design, because the project will eventually produce the real thing for the actors to wear, and will cooperate with many action movies and close-ups, so the commonly used traditional film and television industry software is not competent." "How to transform the 2D sketch into 3D modeling and make the operable objects, then to display natural light and shadow and subtle details on large screens is a big challenge. It also must meet the very strict requirements from directors. Science fiction props' stiff light and shadow relationships are at the mercy of a director's picky eyes. 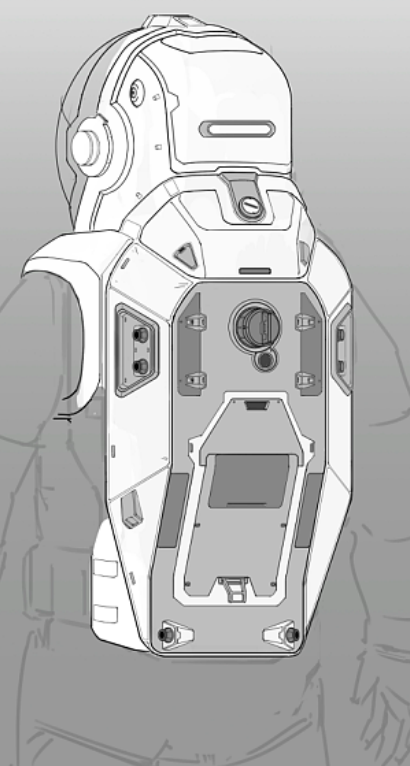 So in many props, especially the spacesuit design modeling process, we use a lot of SubD modeling function of Rhino 6. We use a high-order surface for the round edges part, as far as possible to avoid the basic geometry and filleting edge commands in Rhino, so that when moving in a large screen, the effect will present the natural light and shadow change," Li Jian went on. "The spacesuit is close to the body of the actor and has to cooperate during action performance. We have to develop like the real world. Like products, from the perspective of ergonomics, a large amount of research and testing, continuous production of physical samples, asking the actors to try on the test spacesuits, and to meet the versatility between different body actors. There are many functions to achieve, such as lighting, communications, wearing processes, and ventilation systems. It's basically following the development process of real products, but time and funding are very tight, so the challenge is indeed very large." Li Jian told us, "We have to do a lot of the structural design ourselves in Rhino. The biggest difficulty is the mechanical transmission design. The transparent cover needs to be constantly opened and closed during the shooting process, so we need to use a mechanical transmission to solve this problem. Fortunately, our team has a background in industrial design, with a certain mechanical design basis. During the design period, Rhino's technical support provided us with a plug-in for the gear set in time." "Rhino is different from traditional animation special effects software and engineering software, somewhere between modeling and implementation. Is the most appropriate choice. Without Rhino we cannot imagine such a successful completion of this very challenging project." The middle tester in the picture above is Li Jian. Studio MDI is a film and television physical effects design and production team established by Li Jian's former students. All images in this article are provided by Li Jian and Studio MDI.